Laptop Rental UAE - LED TV, Screen Rental Dubai - Hire Laptops How to Make the Best Use of Video Wall Rental in Dubai? Video walls are such amazing technology that their benefits cannot be fully utilized unless there is proper awareness. As the video walls can essentially be a combination of different monitors, LED screens, projectors to form one large screen, knowing the right facts can help you in making the best use of the video walls. At Techno Edge Systems, we have listed down a few pointers which can help you make the right decision while seeking the Video wall rental in Dubai. As we all know that video wall is a special multi-monitor setup where you can use a combination of screens. The screens could be of different technology, varied resolutions, diverse sizes, and shapes. So the question is why to use video wall when a single screen or a projector can deliver the same results. Nevertheless, the video walls though seem to act like a single screen, they are basically an array of multiple screens. The video walls can be a combination of LCD, LED, and rear projection cubes technologies. Individually, the LCD, LED, or the old-school cathode ray monitors might produce a washed out effect in the presence of the ambient light, the combination, however, produces superior brightness levels. The video walls are controlled by a video wall controller system which is far more complex and complicated than it meets the eye. The regular large screens/projectors are nowhere close to what the video walls can deliver in terms of flexibility, performance, and interactivity. Why choose video wall rental in Dubai? The video walls with its numerous benefits and superior visual performance are a substantial investment even for large enterprises. However, with the option of video wall rentals in Dubai, the small, medium-sized and the large businesses can benefit from its engaging, interactive presentations. Not everyone is tech-savvy to have a deep understanding of how the video walls work. The video rental companies in Dubai, though, can help you identify the right video wall for your event, having good knowledge always helps in taking the well-informed decisions. • Is the venue is large enough? If it is, does it support the installation of the video wall as a centerpiece? • Is the audience going to be seated in an organized way? On the contrary, if the audience is likely to be scattered around and the event is more of an occasion where the attendees are likely to walk around, then installing various screens at different locations in the venue makes a better sense. • Is the audience going to be seated far away from the screen? The lesser the distance between the viewers and the screen, the higher the resolution is required for a clear image. Next factor to figure out is if it is an indoor or an outdoor event. The outdoor LED video walls need to be chosen with extreme care. They are not only expensive but also should be able to endure the rough weather conditions, and are expected to have higher brightness levels to outrun the natural brightness. • The thumb rule is that for every 500 audiences, there should be a display screen size of 17 feet. • For every 1 yard, there should be a pixel pitch of 1mm, which means that for a 10 mm resolution, the audience should be seated 10 yards away. • Based on the overall screen size, the multiple LED screens can be assembled on-site. 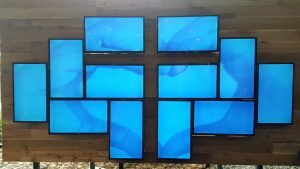 For the effective use of the LED video walls, which allows the use of various screens with different resolutions, screen sizes, and technology, talking to the experts can help you tap the best advantages. For right video wall rental in Dubai, contact Techno Edge Systems at +971-54-4653108 or visit our website www.laptoprentaluae.com for more information.